(Giuseppe Melchiorre Sarto). Born 2 June, 1835, at Riese, Province of Treviso, in Venice. His parents were Giovanni Battista Sarto and Margarita (née Sanson); the former, a postman, died in 1852, but Margarita lived to see her son a cardinal. After finishing his elements, Giuseppe at first received private lessons in Latin from the arch-priest of his town, Don Tito Fusaroni, after which he studied for four years at the gymnasium of Castelfranco Veneto, walking to and fro every day. In 1850 he received the tonsure from the Bishop of Treviso, and was given a scholarship of the Diocese of Treviso in the seminary of Padua, where he finished his classical, philosophical, and theological studies with distinction. He was ordained in 1858, and for nine years was chaplain at Tombolo, having to assume most of the functions of parish priest, as the pastor was old and an invalid. He sought to perfect his knowledge of theology by assiduously studying Saint Thomas and canon law; at the same time he established a night school for adult students, and devoted himself of the ministry of preaching in other towns to which he was called. In 1867 he was named arch-priest of Salzano, a large borough of the Diocese of Treviso, where he restored the church, and provided for the enlargement and maintenance of the hospital by his own means, consistently with his habitual generosity to the poor; he especially distinguished himself by his abnegation during the cholera. He showed great solicitude for the religious instruction of adults. In 1875 he was made a canon of the cathedral of Treviso, and filled several offices, among them those of spiritual director and rector of the seminary, examiner of the clergy, and vicar-general; moreover, he made it possible for the students of the public schools to receive religious instruction. In 1878, on the death of Bishop Zanelli, he was elected vicar-capitular. On 10 November, 1884, he was named Bishop of Mantua, then a very troublesome see, and consecrated on 20 November. His chief care in his new position was for the formation of the clergy at the seminary, where, for several years, he himself taught dogmatic theology, and for another year moral theology. He wished the doctrine and method of St. Thomas to be followed, and to many of the poorer students he gave copies of the "Summa theologica"; at the same time he cultivated the Gregorian Chant in company with the seminarians. The temporal administration of his see imposed great sacrifices upon him. In 1887 he held a diocesan synod. By his attendance at the confessional, he gave the example of pastoral zeal. The Catholic organization of Italy, then known as the "Opera dei Congressi", found in him a zealous propagandist from the time of his ministry at Salzano. At the secret consistory of June, 1893, Leo XIII created him a cardinal under the title of San Bernardo alle Terme; and in the public consistory, three days later, he was preconized Patriarch of Venice, retaining meanwhile the title of Apostolic Administrator of Mantua. Cardinal Sarto was obliged to wait eighteen months before he was able to take possession of his new diocese, because the Italian government refused its exequatur, claiming the right of nomination as it had been exercised by the Emperor of Austria. This matter was discussed with bitterness in the newspapers and in pamphlets; the Government, by way of reprisal, refused its exequatur to the other bishops who were appointed in the meantime, so that the number of vacant sees grew to thirty. Finally, the minister Crispi having returned to power, and the Holy See having raised the mission of Eritrea to the rank of an Apostolic Prefecture in favour of the Italian Capuchins, the Government withdrew from its position. Its opposition had not been caused by any objection to Sarto personally. At Venice the cardinal found a much better condition of things than he had found at Mantua. There, also, he paid great attention to the seminary, where he obtained the establishment of the faculty of canon law. In 1898 he held the diocesan synod. He promoted the use of the Gregorian Chant, and was a great patron of Lorenzo Perosi; he favoured social works, especially the rural parochial banks; he discerned and energetically opposed the dangers of certain doctrines and the conduct of certain Christian-Democrats. The international Eucharistic Congress of 1897, the centenary of St. Gerard Sagredo (1900), and the blessing of the corner-stone of the new belfry of St. Mark's, also of the commemorative chapel of Mt. Grappa (1901), were events that left a deep impression on him and his people. Meanwhile, Leo XIII having died, the cardinals entered into conclave and after several ballots Giuseppe Sarto was elected on 4 August by a vote of 55 out of a possible 60 votes. His coronation took place on the following Sunday, 9 August, 1903. In his first Encyclical, wishing to develop his programme to some extent, he said that the motto of his pontificate would be "instaurare omnia in Christo" (Ephesians 1:10). Accordingly, his greatest care always turned to the direct interests of the Church. Before all else his efforts were directed to the promotion of piety among the faithful, and he advised all (Decr. S. Congr. Concil., 20 Dec., 1905) to receive Holy Communion frequently and, if possible, daily, dispensing the sick from the obligation of fasting to the extent of enabling them to receive Holy Communion twice each month, and even oftener (Decr. S. Congr. Rit., 7 Dec., 1906). Finally, by the Decree "Quam Singulari" (15 Aug., 1910), he recommended that the first Communion of children should not be deferred too long after they had reached the age of discretion. It was by his desire that the Eucharistic Congress of 1905 was held at Rome, while he enhanced the solemnity of subsequent Eucharistic congresses by sending to them cardinal legates. The fiftieth anniversary of the proclamation of the dogma of the Immaculate Conception was an occasion of which he took advantage to enjoin devotion to Mary (Encyclical "Ad illum diem", 2 February, 1904); and the Marian Congress, together with the coronation of the image of the Immaculate Conception in the choir of St. Peter's, was a worthy culmination of the solemnity. As a simple chaplain, a bishop, and a patriarch, Giuseppe Sarto was a promoter of sacred music; as pope, he published, 22 November, 1903, a Motu Proprio on sacred music in churches, and at the same time ordered the authentic Gregorian Chant to be used everywhere, while he caused the choir books to be printed with the Vatican font of type under the supervision of a special commission. In the Encyclical "Acerbo nimis" (15 April, 1905) he treated of the necessity of catechismal instruction, not only for children, but also for adults, giving detailed rules, especially in relation to suitable schools for the religious instruction of students of the public schools, and even of the universities. He caused a new catechism to be published for the Diocese of Rome. As bishop, his chief care had been for the formation of the clergy, and in harmony with this purpose, an Encyclical to the Italian episcopate (28 July, 1906) enjoined the greatest caution in the ordination of priests, calling the attention of the bishops to the fact that there was frequently manifested among the younger clergy a spirit of independence that was a menace to ecclesiastical discipline. In the interest of Italian seminaries, he order them to be visited by the bishops, and promulgated a new order of studies, which had been in use for several years at the Roman Seminary. On the other hand, as the dioceses of Central and of Southern Italy were so small that their respective seminaries could not prosper, Pius X established the regional seminary which is common to the sees of a given region; and, as a consequence, many small, deficient seminaries were closed. For the more efficient guidance of souls, by a Decree of the Sacred Congregation of the Consistory (20 August, 1910), instructions were given concerning the removal of parish priests, as administrative acts, when such procedure was required by grave circumstances that might not constitute a canonical cause for the removal. At the time of the jubilee in honour of his ordination as a priest, he addressed a letter full of affection and wise council to all the clergy. By a recent Decree (18 Nov., 1910), the clergy have been barred from the temporal administration of social organizations, which was often a cause of grave difficulties. The pope has at heart above all things the purity of the faith. On various occasions, as in the Encyclical regarding the centenary of Saint Gregory the Great, Pius X had pointed out the dangers of certain new theological methods, which, based upon Agnosticism and upon Immanentism, necessarily divest the doctrine of the faith of its teachings of objective, absolute, and immutable truth, and all the more, when those methods are associated with subversive criticism of the Holy Scripture and of the origins of Christianity. Wherefore, in 1907, he caused the publication of the Decree "Lamentabili" (called also the Syllabus of Pius X), in which sixty-five propositions are condemned. The greater number of these propositions concern the Holy Scripture, their inspiration, and the doctrine of Jesus and of the Apostles, while others relate to dogma, the sacraments, and the primacy of the Bishop of Rome. Soon after that, on 8 Sept., 1907, there appeared the famous Encyclical "Pascendi", which expounds and condemns the system of Modernism. It points out the danger of Modernism in relation to philosophy, apologetics, exegesis, history, liturgy, and discipline, and shows the contradiction between that innovation and the ancient faith; and, finally, it establishes rules by which to combat efficiently the pernicious doctrines in question. Among the means suggested mention should be made of the establishment of an official body of "censors" of books and the creation of a "Committee of Vigilance". Subsequently, by the Motu Proprio "Sacrorum Antistitum", Pius X called attention to the injunctions of the Encyclical and also to the provisions that had already been established under Leo XIII on preaching, and proscribed that all those who exercised the holy ministry or who taught in ecclesiastical institutions, as well as canons, the superiors of the regular clergy, and those serving in ecclesiastical bureaux should take an oath, binding themselves to reject the errors that are denounced in the Encyclical or in the Decree "Lamentabili". 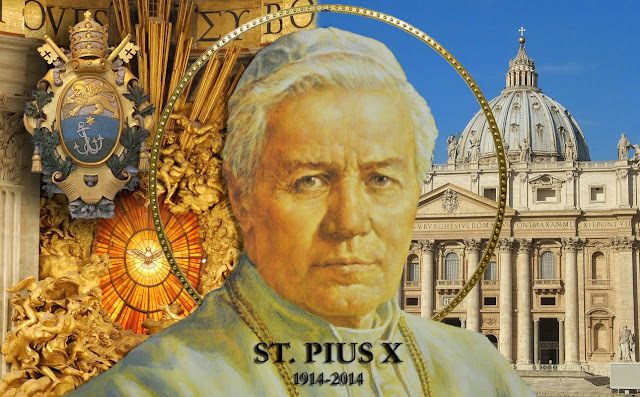 Pius X reverted to this vital subject on other occasions, especially in those Encyclicals that were written in commemoration of St. Anselm (21 April, 1909) and of St. Charles Borromeo (23 June, 1910), in the latter of which Reformist Modernism was especially condemned. As the study of the Bible is both the most important and the most dangerous study in theology, Pius X wished to found at Rome a centre for these studies, to give assurance at once of unquestioned orthodoxy and scientific worth; and so, with the assistance of the whole Catholic world, there was established at Rome the Biblical Institute, under the direction of the Jesuits. A need that had been felt for a long time was that of the codification of the Canon Law, and with a view to effecting it, Pius X, on 19 March, 1904, created a special congregation of cardinals, of which Mgr Gasparri, now a cardinal, became the secretary. The most eminent authorities on canon law, throughout the world, are collaborating in the formation of the new code, some of the provisions of which have already been published, as, for example, that modifying the law of the Council of Trent on secret marriages, the new rules for diocesan relations and for episcopal visits ad limina, and the new organization of the Roman Curia (Constitution "Sapienti Consilio", 29 June, 1908). Prior to that time, the Congregations for Relics and Indulgences and of Discipline had been suppressed, while the Secretariate of Briefs had been united to the Secretariate of State. The characteristic of the new rule is the complete separation of the judicial from the administrative; while the functions of the various bureaux have been more precisely determined, and their work more equalized. The offices of the Curia are divided into Tribunals (3), Congregations (11), and Offices (5). With regard to the first, the Tribunal of the Signature (consisting of cardinals only) and that of the Rota were revived; to the Tribunal of the Penitentiary were left only the cases of the internal forum (conscience). The Congregations remained almost as they were at first, with the exceptions that a special section was added to that of the Holy Office of the Inquisition, for indulgences; the Congregation of Bishops and Regulars received the name of Congregation of the Religious, and has to deal only with the affairs of religious congregations, while the affairs of the secular clergy are to be referred to the Congregation of the Consistory or of that of the Council; from the latter were taken the matrimonial cases, which are now sent to the tribunals or to the newly-created Congregation of the Sacraments. The Congregation of the Consistory has increased greatly in importance, since it has to decide questions of competence between the various other Congregations. The Congregation of Propaganda lost much of its territory in Europe and in America, where religious conditions have become regular. At the same time were published the rules and regulations for employees and those for the various bureaux. Another recent Constitution relates to the suburbicarian sees.